Chichen Itza sightseeing tours and attractions. Reserve tickets online and save on all sightseeing activities and things to do in Chichen Itza. 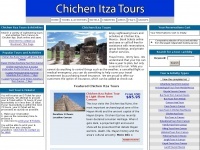 Order online or call us toll-free at 800-208-4421.
two profiles were found for Chichenitzatours.net in social networks. Among other social networks the website is represented in Facebook and Twitter. The web server used by Chichenitzatours.net is located in Chapel Hill, USA and is run by Rackspace Hosting. There are many websites run by this web server. The operator uses this server for many hosting clients. In total there are at least 165 websites on this server. The language of these websites is mostly english. The Chichenitzatours.net websites were developed using the programming language PHP and served by a Apache server. The website uses the latest markup standard HTML 5. The website prohibits search engines and webcrawlers using the description of the website from the Yahoo directory. Other actions by webcrawlers and bots are allowed.